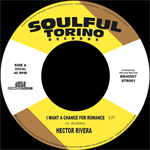 Just reissued on seven-inch vinyl by Italian label Soulful Torino (in association with Record Kicks) is Hector Rivera’s Latin dancefloor classic – "I Want A Chance For Romance". This reissue of the 1967 track features the original version on the A-side, with an instrumental version on the B-side. According to the label, this is the first time this has been available on 45. However, if you know better, speak up! You can pick it up online now from the Record Kicks online shop (where you can also hear it if the track has passed you by) on a fairly weighty vinyl for six Euros. What about the Barry issue, plenty of them around if you have £100 – £200. There are no chance to romance with hector at 100 quids, the barry 45 you are talking about are VERY RARE. I know only one man that has got one. You probably talk about “at the party ” or something else that can be purchased for max 10 GBP. I would buy Chance for Romance (’68 on Barry) at 100 GBP but no one is selling it.